Welcome to the next stop on the Touch of Power Blog Tour! I'd actually never read anything by Maria V. Snyder before and now I have rushed to the Kindle store to see what she's got! I am SO impressed. I want more. 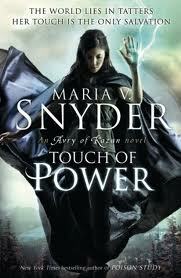 Here you'll find my review of her newest book, Touch of Power, and a mini interview. Let's get this sweet party started! A special Thank you to MIRA for sending me this book to review. Whoa whoa whoa! If you liked Graceling by Kristen Cashore then you are going to love Touch of Power! My mind is still on fire with this book! I loved the preface. A girl who can heal, but takes on the person's illness as her own to do so. Avry is a selfless person to do such a thing. Even though she heals faster than a normal person, she is still in pain. That alone says so much about her character. I like her. A lot. There is seriously so much going on here. So much to like I don't even know where to begin. The characters all have such good personalities. 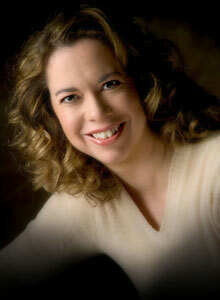 Author Maria Snyder gave a sense of humor to even the smallest of characters. You get to learn about the main characters pasts, and how they are changing now, and then by the end of the book the people they have become. I LOVE good character development! It truly makes a story for me. Let's not stop there though. The plot alone is so creative. There were so many things going on one after another. I was forming my own solutions in my mind and hoping for a way to save the day. I did not see what was coming, ever! The romance. If you read my blog at all you know I'm in love with the romance of it all. I was wondering if there ever would be any! I kept feeling it, hoping for it, wishing for it to come true before it was too late. It made the story all that much better. You know how I hate spoilers, so I won't say any more. If you've been looking for a great book to start off 2012, this is it!! I'm already itching for the next book in the series. Oh, and saying that it is a sequel doesn't mean there is a cliffhanger. I hate cliffhangers. Thank you Maria Snyder for tying it up neat for me. I didn't have to throw the book across the room. Now I can peacefully await the next book and its awesomeness! 'Is that even a word?' Kerrick asked. 'He probably means you're impotent,' I offered." For those who haven't read A Touch of Power let them know they can expect. Give us a little blurb if you will. Touch of Power is a fantasy novel about a healer set in a world that is recovering from a deadly plague. Avry’s world has blamed the plague on the healers and has hunted them down. She is finally caught only to be rescued by a group who wants her to heal their Prince. The group's leader, Kerrick, knows the healers aren't to blame for the plague and that she could do some good for a change instead of hiding. Unfortunately, she believes this Prince is the one who started blaming the plague on the healers so she isn't risking her life for some pampered Prince. As they travel to the Prince's hidden location, they're pursued by others who have realized having a healer around might just be a good thing for them, but not necessarily for her. What is the best part about being a published author? The worst? The best part is communicating with my readers! The emails I receive are wonderful and meeting them at book signings is very rewarding. The worst are nasty reviews. I don’t mind a bad review if it’s obvious the reviewer put time and thought into it and actually read the book, but those that are outright nasty are the worst! Do you have a bucket list? If so, what are some of the items on your list? To buy a motorcycle (I already have my license), to get another dog, to travel to all the wonders of the world, both natural and cultural, and to buy a house at the beach. Where and When are some of your upcoming events, so we can get our books signed! January 18, 2012 Book Signing and Discussion with the Watch the Skies Book Club ( at the Midtown Scholar Bookstore, 1302 North Third Street, Harrisburg, Pennsylvania, 17102) 7:00 p.m. to 9:00 p.m.
January 28, 2012 Book Signing at Books A Million (5125 Jonestown Road, Harrisburg, Pennsylvania, 17112) 1:00 p.m. to 3:00 p.m.
February 4, 2012 Book Signing at the Cupboard Maker Books (157 N. Enola Road, Routes 11 & 15, Enola, Pennsylvania, 17025. 717-732-7288). 1:00 p.m. to 4:00 p.m.
March 17, 2012 Participating in the Liberty States Fiction Writers' Create Something Magical Conference (Renaissance Woodbridge Hotel, 515 Route 1, South & Gill Lane, Iselin, New Jersey 08830) Please go to the website to register and for more details. They'll have both a reader and a writer programming tracks so you don't need to be an aspiring writer to attend :) There will also be a book signing from 5:30 p.m. to 7:00 p.m. that's open to the public. The conference runs all day and there's a party after the book signing! May 18 - 20, 2012 Participating in Pennwriter's Annual Writers Conference and this year I'm the Saturday Keynote Speaker!! Lancaster, PA. Create a video review of A Touch of Power and be in with a chance of winning an iPad! Maria V. Snyder has teamed up with top teen mag Mizz to give you the chance to win an iPad and be the official book review for MizzMag TV to boot! All you need to do to enter is make a video review of A Touch of Power. MIRA Ink is giving away free review copies to the first 50 people who get in touch, so visit facebook/MIRAInk for more details on how to get involved! Also, check out Mizz Mag TV at www.youtube.com/user/MizzMagTV for an exclusive video of Maria talking about her new Healer series! Romance Novels: What's with the Stereotype? Top Ten Tuesday: 2012 Books I'm Excited For!